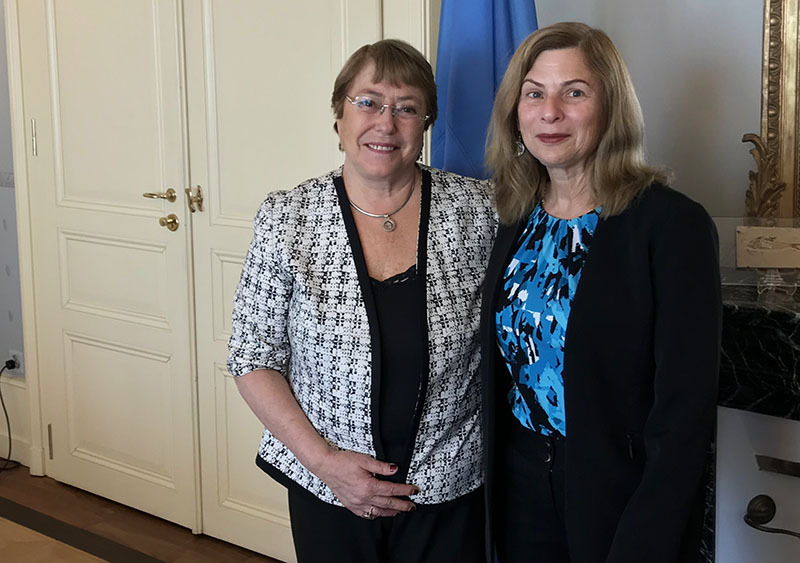 United Nations High Commissioner on Human Rights, Michelle Bachelet (left), meets with Fair Food Standards Council’s Judge Laura Safer Espinoza on the Fair Food Program in Geneva, Switzerland, last week. In 1993, United Nations’ Office of the High Commissioner for Human Rights (OHCHR) was established “to promote and protect the human rights that are guaranteed under international law and stipulated in the Universal Declaration of Human Rights of 1948.” The Universal Declaration emerged from the rubble of World War II, in which rogue states and violent political ideologies represented the greatest threat to human rights around the world. But by the time the OHCHR was founded nearly fifty years later, much had changed in the field of human rights, including the emergence of massive private corporations with economic power far greater than that of many states, and with the responsibility born of that power to protect the human rights of workers toiling in their vast, global supply chains. Sadly, however, the indisputable increase in the incidence of human rights violations at the bottom of corporate supply chains over the past several decades – violations ranging from modern-day slavery to sexual violence and unconscionable poverty – has made a mockery of the vast majority of corporate-led social responsibility purporting to protect workers’ fundamental rights. In light of this undeniable epidemic of exploitation, the United Nation’s Working Group on Business and Human Rights – the branch of the OHCHR that is specifically charged with looking after the rights of workers in corporate supply chains – has stepped up its efforts to identify and promote proven solutions. Declaring, “people around the world who have suffered adverse human rights impacts as a result of business activity continue to face many serious barriers to remedy and justice,” the Working Group recently launched a process aimed at strengthening access to remedy for workers and communities around the globe. As part of that process, forty international human rights experts gathered just over a week ago at the headquarters of the United Nations in Geneva, Switzerland. The goal of the gathering was to identify the best practices for protecting human rights in corporate supply chains from around the world, and the Fair Food Program was at the table. Headquarters of the United Nations in Geneva, Switzerland. Since its very first visit to Immokalee in 2013, the UN Working Group on Business and Human Rights has identified the Fair Food Program as a uniquely successful remedy to human rights abuse, a rare example of the UN’s Guiding Principles on Business and Human Rights in action. And since that first visit, Fair Food Program representatives have been invited to address the United Nations at multiple annual forums, and have participated in consultations on forced labor and gender-based violence. At this most recent gathering in Geneva, Judge Laura Safer Espinoza, the Executive Director of the Fair Food Standards Council, shared many of the invaluable lessons learned since 2011 through the implementation and operation of the Fair Food Program’s worker-driven model of social responsibility. Her contributions touched on all of the critical areas currently being examined by the Working Group, including: practical steps that can be taken to meet the effectiveness criteria of the UN’s Guiding Principles; safeguards for rights-holders from retaliation, harassment and intimidation; and meaningful stakeholder involvement in the design, implementation and follow-up monitoring of remedial outcomes. In an unforgettable moment from her latest visit to Geneva, Judge Safer Espinoza was invited to a meeting with the new High Commissioner of Human Rights, former Chilean President Michelle Bachelet (below), who was keenly interested in learning more about the Fair Food Program. Michelle Bachelet being sworn in as the new UN High Commissioner for Human Rights. No stranger to the struggle for human rights, Ms. Bachelet, a pediatrician by profession, was imprisoned and tortured during Chile’s military dictatorship. After democracy was restored, she became the country’s Minister of Health and the first female Minister of Defense, and then served as President of Chile from 2006 to 2010 – the first woman to occupy that position. After leaving the presidency in 2010, she was appointed as first executive director of the newly-created United Nations Entity for Gender Equality and the Empowerment of Women. In December 2013, Ms. Bachelet became the first president of Chile to be re-elected since 1932. Just a few short weeks ago, Ms. Bachelet assumed the role of UN High Commissioner for Human Rights. During the meeting in Geneva, High Commissioner Bachelet was deeply impressed by the progress made by the FFP in eliminating forced labor and gender-based violence, and expressed the hope to someday visit Immokalee to see the award-winning Program in action – a visit we here in Immokalee would be thrilled to host. We are, as always, honored to have the opportunity to join the global conversation about the fight to end human rights abuses, both in communities across the world and in global supply chains. We look forward to continuing to expand the proven impact of the Worker-driven Social Responsibility model to new industries across the globe in the years ahead!